Cool, creamy, and bursting with excitement-- it’s no wonder why most people are so caught up with the milk tea craze. But how about trying something from the makers of the biggest froyo (Frozen Yogurt) chain in the country? Now, that’s something new for sure. Who wouldn’t love cooling down with a semi-sweet, flavorful combo of milk and tea while dabbling some chewy and plump tapioca? After all, this one offers a different kind of beverage wonder to a thirsty and adventurous soul. At Californiaberry, they made the excitement even more deliciously memorable in every cup of Boba milk tea! Made from the finest tea leaves of Taiwan with the perfect blend of milk and right amount of sugar, Californiaberry milk tea makes the drinking pleasure a little more exciting with its black boba balls--bigger, tastier, and softer with the fun texture of a gummy bear. For someone who likes surprises, this one will surely tease any tropical palate with these marbles as you drink up a delicious mix of concoction. Aside from these, both medium (P75) or large (P85) sizes offers sprawling choices of flavors such as jasmine, taro, almond, yogurt, coffee, honey milk green, honey milk, and even iced coffee! And if milk tea is not your fancy, try the juices. From green tea, black tea, passion fruit green tea, or yogurt green tea, you’ll be surprised how Californiaberry expertly connived the wonderful flavors of tea leaves and sugar. enjoying the CaliforniaBerry Boba Milk Tea! For some, Californiaberry has become the place to converge. If you need to recharge and enjoy some lazy days, patrons will come for stopovers to savor a mouthwatering froyo, shakes, pastas, and even a good cup of organic coffee. 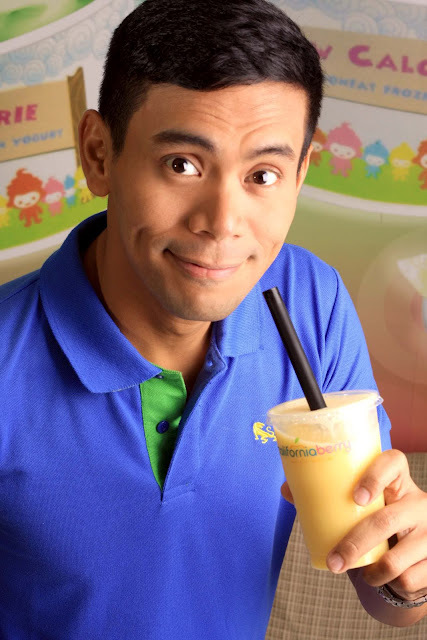 Now that there’s an authentic milk tea in the counter, why not relive the experience once more and get enamored over these drink sensation, the unique way. At Californiaberry, they’re committed to satisfy every cravings--from sweet to savory and now with something refreshingly fun! Californiaberry is now serving nationwide with over 25 stores, including the newly-opened branches at Market Market, The Fort and Ateneo de Manila. Also located in Mezza Residences, Sta. Mesa, SM Fairview, SM Novaliches, Banawe (Quezon City), Greenhills (Ortigas), Tomas Morato, SM North Edsa (The Block), SM Southmall (Las Pinas), SM Manila, SM Megamall, SM Novaliches, Robinson’s Galleria, The Fort (Global City) SM Iloilo, Gaisano Mall (Davao City), DLSU (Manila), Sta. Lucia Mall (Cainta), Ateneo (Katipunan), UST (Manila), and Walter Mart (Makati), Festival Mall (Filinvest, Alabang) and BF Homes Paranaque. and Like CALIFORNIABERRY on Facebook for the latest updates on promos and freebies. Don't Forget to Like ALEXBAM2006IN3D on Facebook for latest updates!